employee wellness | Live Healthy S.C.
March is National Nutrition Month and here at DHEC, we are celebrating healthy eating with food demonstrations and fresh local produce. In Central Office, members of our WIC and SNAP teams recently provided three separate 30-minute engaging food demonstrations using fresh produce from our new mobile Farmers Market service, provided by Jumper Farm. In addition, the Pee Dee Region recently hosted a Lunch and Learn at the Florence Health Department, with 31 people in attendance. 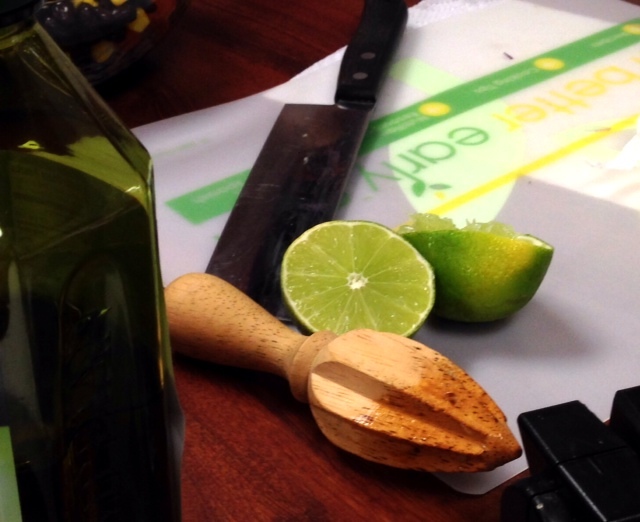 Two registered dietitian staff from the region provided recipes for multiple meals, and also discussed ways to reduce sodium, fat and calories with just a few small changes. Eating healthy not only feeds your body, it feeds your mind. To find healthy options near you, check out letsgosc.org. This entry was posted in Community Health, Employee Wellness, Outreach and tagged employee wellness, farmers market, nutrition, Pee Dee, worksite wellness on March 6, 2015 by SC DHEC. One of the most popular New Year’s resolutions is to start eating healthier. So beginning this Monday, January 5, we’ll be offering a weekly, mobile farmers market at three of our Central Office locations to help our busy staff buy fresh, seasonal groceries from the convenience of their workplace. Each week, we’ll be sending out an email alerting staff that the mobile farmers market has arrived onsite. We’ll also offer a tasty, seasonal recipe courtesy of our WIC nutrition staff that you can use to prepare affordable and healthy meals for your family. For more details on the types of seasonal items that may be offered, as well as average prices, check out the Jumper Farm pricing sheet (cash or checks accepted). We’ve also created a quick “Keeping it Fresh” guide to help you store and prepare your fresh produce each week. I hope our new mobile farmers market service will help inspire a healthier start to 2015 for you and your family. Happy New Year! This entry was posted in Employee Wellness and tagged A Healthier State, employee wellness, healthy eating, nutrition, resolutions, worksite wellness on January 2, 2015 by SC DHEC. A few weeks ago, DHEC launched our annual employee flu vaccination drive. This year, we decided to try something new to make it as easy as possible for our busy staff to get their vaccine. Instead of holding traditional clinic dates, our nursing team went door-to-door, offering each one of our nearly 3,500 employees a vaccine in the comfort of their office. 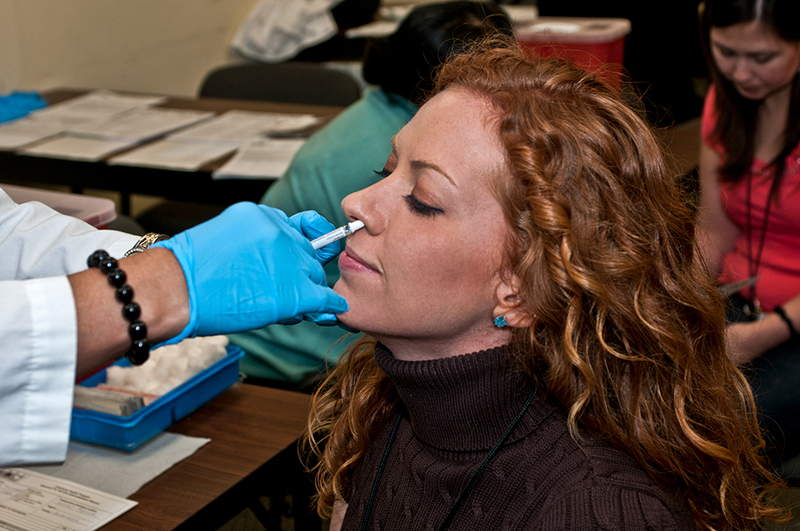 We also gave employees the option of receiving a nasal mist vaccine as an alternative to the shot for the first time. As a result, we’ve achieved a new record participation rate, with 85% of DHEC employees now vaccinated against the flu only 8 weeks into the campaign. I would like to take a moment to recognize a few of our areas who have gone a step beyond and have already earned a 100% participation rate in the employee flu vaccine campaign. In our regions, the Midlands has become the first regional team to achieve a 100% vaccination status. Thank you to the entire Midlands team for helping to protect our clients and your fellow colleagues from the flu this year. This entry was posted in Employee Wellness, Outreach, Prevention and tagged employee wellness, flu, immunizations, innovation, prevention, vaccines on December 5, 2014 by SC DHEC. With the start of the new flu season, DHEC is taking proactive measures to prevent the spread of flu in our workplace. Starting October 8, we’ll be offering all DHEC employees a free flu vaccination to help our staff stay healthy this flu season. New this year, we will be taking the flu vaccine door-to-door, offering employees a quick and convenient way to get their flu vaccine without having to make an appointment or wait in line. A Public Health nurse will come by your office and offer you a flu vaccine in the comfort of your own workspace. If you’re not in when the nurse stops by, you will receive a card with information on when the nurse will return to offer you a vaccine. This entry was posted in Disease Control, Employee Wellness, Prevention and tagged employee wellness, flu, nursing, prevention, vaccines on October 3, 2014 by SC DHEC. If you’ve been following the news this week, you know it’s been an exciting week for the agency. On Wednesday, DHEC Director Catherine Templeton joined the SC Obesity Council in launching our state’s first-ever obesity action plan. The new plan details both long- and short-term strategies that can be immediately implemented to begin reducing the rate of obesity here in the Palmetto State. During the launch event at the State Farmers Market, we also introduced South Carolinians to scaledown.org – a new, collaborative initiative designed to engage and mobilize stakeholders across the state in implementing the strategies laid out in the new action plan. This entry was posted in Community Health, Employee Wellness, Outreach, Prevention, Uncategorized and tagged employee wellness, Jamie Shuster, Jennifer Read, obesity, scaledown.org, South Carolina on September 26, 2014 by SC DHEC.